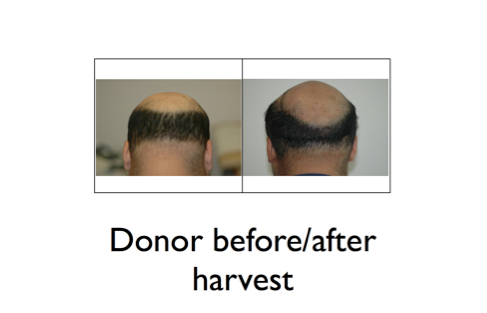 Here’s our latest Q&A with Dr. Arocha regarding donor harvest. If you have a question for Doctor Arocha you would like answered on our blog, please email us with your question. Q. Hi, Doc. I’ve been researching hair-transplantation, and I have a question concerning F.U.T. (strip-harvesting): I understand, in this method, a strip is excised from the back of the scalp, the wound then closed. I wonder, then, is not the overall surface of the scalp reduced in this procedure? After two or three procedures, especially, (or even after one large session) — when, totally, a reasonably wide portion of the scalp has been removed, will not a patient’s hairline, in accordance, also be shifted? That is, the front hairline would move back by the amount of scalp excised, or, more likely, the “rear hairline” (which ends at the back of the neck) must certainly be “moved upward.” At least, this is how I imagine it would be. Is my logic flawed? I’ve been trying to understand this in researching the procedure, but the point still evades me. I understand a physician will take into consideration laxity of the scalp, so what I’m talking about might not be immediately noticed — I also hear doctors will try to cut out strips that are longer rather than wider, to reduce tension — but, ultimately (again, especially when a large number of grafts must be harvested), will not the hairlines (front and certainly rear) be affected? A. Initially, there is a temporary shortening of the donor zone. Note the change in the width of the posterior fringe, the after photo is taken immediately post-harvest after a 2 cm wide strip was removed. The effect is short-lived as the tissue stretching back to it’s original dimensions, this is the aptly named stretch back. Q. If so, is this effect permanent? The piece of scalp taken out can’t “regenerate,” can it (and, if it could, would it regenerate hair follicles, too)? A. No,the removed follicles will grow in the transplanted location, but they will not regenerate. Q. 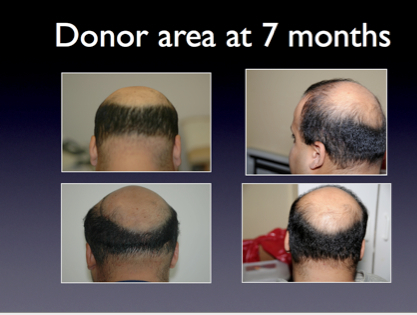 Can hair that’s already been transplanted to a new location be removed and successfully retransplanted in another area (e.g., back to front, then, later, if need be, north of that region)? A. Yes, absolutely. I have transplanted chest hair to scalp, where it grew happily for months. Then later these transplanted chest hairs were removed and could have been transplanted anywhere on this patient.